Currently, every day there is a new announcement about the Space Launch System (SLS). NASA’s 2020 budget proposal contemplates deleting many missions of the SLS. The SLS will not be used to assemble the LOP-G, nor to launch the Europa Clipper spacecraft. On March 13th, Jim Bridenstine said that NASA plans to make Orion‘s first flight on a private launcher. The SLS will probably not be ready until 2021 or 2022 and Jim Bridenstine seems to want to keep the first launch of Orion in 2020. These statements raise many questions about the usefulness of the SLS. Orion’s first mission would be only a temporary solution. The SLS will then be used to launch the spacecraft. But NASA could get used to using low-cost launchers. More than ever, the role of the SLS seems to be to maintain jobs of the space shuttle industry. The US space agency also seeks to relieve Boeing, the main contractor of the SLS, which is already busy with the Boeing 737 Max scandal. To replace the SLS on the first mission of the Orion spacecraft around the Moon, it will take two commercial launches. The first will be used to put Orion in orbit of the moon, and the other will be used to launch a module for the injection on the Moon. Both parts should make an orbital rendezvous before heading to the moon. Jim Bridenstine spoke about the Delta 4 and Delta 5 space rocket. However, ULA may not be able to provide two launchers in time. SpaceX could also be a candidate with the Falcon Heavy. If NASA wishes to keep the aim of mid-2020, it must make decisions quickly. This date would schedule the flight of the American spacecraft around the Moon in the middle of the presidential campaign. In NASA’s 2020 budget proposal, the Block 1B version of the space rocket could be postponed, to focus on the initial version. The goal is to conduct more regular missions with the initial release. The Block 1B version of the SLS was to launch the elements of the LOP-G, the future space station in lunar orbit. The LOP-G should now go on commercial launchers, but we do not know which ones yet. Despite this refocusing, the first mission of the SLS and Orion seems to slip a little more. It is now scheduled for the start of the 2020 decade, which probably means 2021 or 2022. 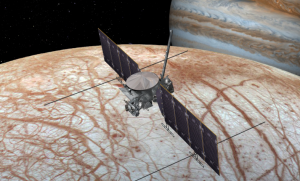 Another blow to NASA’s giant launcher is that the Europa Clipper mission will eventually leave on another launcher. A commercial launcher would save $ 700 million. In 2020, NASA hopes to launch its heavy launcher, a rocket of enormous power that will be able to give the United States the ability to conduct manned missions beyond the low orbit. This rocket is called Space Launch System (SLS). The SLS has been officially in development since 2011. In reality, the program started much longer ago : the SLS largely takes over the design of the Ares rocket. This program was launched by George Bush in 2004 and stopped by Barack Obama in 2010. The Constellation program was to bring men back to the moon in 2020. For that, it needed a very big rocket, Ares, which was destined to become the most powerful rocket in history, more powerful than the Saturn 5. Due to a change of administration at the White House, the development of Ares 5 was stopped. But just after the shutdown of the Constellation program, space shuttles retired. But the launch and maintenance of space shuttles gave life to an entire ecosystem of private companies and subcontractors, which represented thousands of jobs. The maintenance of American space capabilities was also at stake. To replace space shuttles as quickly as possible, NASA turned to the private sector : SpaceX, Orbital ATK or Boeing will be able to fulfill most of the missions assigned to space shuttles. And to save the US space sector, NASA has launched the development of a new heavy launcher that would take many components of the space shuttle and would therefore give work to most of its subcontractors. 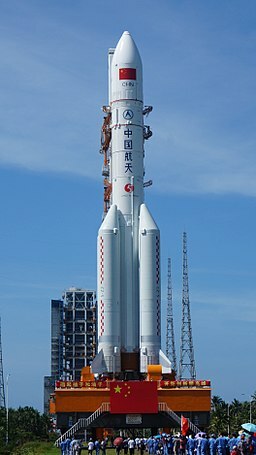 The SLS was designed to meet an economic objective and not a space program objective : the specifications of the rocket was more poetic than pragmatic when it was announced in 2011. The SLS must send NASA’s astronauts farther and push the boundaries of human exploration. Concretely, this means that the SLS should be able to carry the Orion manned capsule, which was also conceptualized as part of the Constellation program. Thus began one of the most expensive developments in the history of the NASA. The SLS is therefore a kind of Ares 5 at a discount. It takes many elements from the space shuttle. We immediately notice a huge orange floor surrounded by two side powder thrusters, like a kind of space shuttle without the space shuttle. The Space Launch System is planned to be available in several versions that will become available as development progresses. The first version, which should fly in 2020, is called Block 1. Its central body is designed from the outer tank of the space shuttle. The first floor is equipped with four RS-25 engines also recovered on space shuttles. The engines used during the first flights will come directly from the space shuttle program but these engines are expensive since they were originally intended to be recovered and reused many times on space shuttles. Ultimately, the SLS should have an adapted version of the RS-25 designed to be fired once and therefore less expensive. The first floor of the SLS burns hydrogen and liquid oxygen. RS-25 are the most efficient liquid propellant chemical engines on the planet. The central body will still be more than 8 meters in diameter. Around this central body will be located two powder boosters. It is Orbital ATK that produces these components. There have been some changes comparing to the space shuttle boosters : the main change is the addition of a segment. The space shuttle boosters had 4 fuel segments while the SLS will have 5. That means that each booster will be able to provide 25% more total impulse. Unlike the space shuttle boosters, no recovery attempt will be made for those of the SLS. These boosters will be present on the Block 1 version and Block 1B version of the rocket. For the Block version of the SLS, the NASA plans to develop new boosters. The second floor of the SLS will be different depending on the mission. The second floor of the Block 1 version of the rocket will be a modified version of the Delta 4 rocket. This second floor will be equipped with a single engine that also burns oxygen and liquid hydrogen. In this configuration, the SLS will be able to carry up to 70 tons in low orbit. This configuration is a bit special since it should only be used on one mission : it will be used for the rocket baptism where the SLS will bring an unmanned Orion capsule to fly over the Moon. After this mission, the rocket will not take off for 2 years. The Block 1B version of the SLS will arrive then. This version will be available in two versions : Block 1B Crew for crew transport, and Block 1B Cargo for logistics transport or the launch of interplanetary spaces probes. The Block 1B version will have a new second floor that will accommodate four engines and will be of a diameter similar to that of the rocket, that is to say a little more than 8 meters. In the Crew version, the SLS will carry the Orion capsule. But its additional power should allow it to take in addition modules of the Lunar Orbital Platform-Gateway (LOP-G), a new space station around the moon. The Space Launch System would be used to assemble and service this space station. The Cargo version could be used for space probes. The first mission of the Block 1B version should be to send the Europa Clipper space probe in 2022. Around 2030 the Block 2 version of the SLS will arrive, the most powerful version thanks to its new side boosters and an oversized headdress that should be able to place 130 tons of payload in low orbit. Theoretically, it would be the rocket that would allow interplanetary travel. It is therefore well placed to bring NASA to Mars. The development of the SLS and the Orion capsule, which have never fly, have already cost tens of billions of dollars. The unit price of an SLS is expected to be between $ 500 million and $ 1 billion. This is a rocket that NASA will launch only for special occasions. For now, the US space agency is planning a dozen missions for its rocket, spread over the next 15 years. The main role of the SLS would be the assembly and support of the LOP-G. But the NASA has not found any funding yet. Between today and 2030 there will be 3 elections in the White House and therefore three opportunities to change plans again. Republicans love lunar programs while Democrats are more attracted to Mars and asteroids. If the LOP-G program does not materialize, the SLS will likely become the biggest waste of money in the history of the US space administration. Some estimates place the cost of developing the rocket and its space capsule at $ 43 billion, which is almost half the cost of Apollo program adjusted for inflation, and this does not take into account any mission, only development costs. The Space Lauch System illustrates the big NASA’s problems : the US space agency is often considered by the US Congress as a job provider, the scientific objectives are not always the prior and its projects are sensitive of the administration changes. Will the first men arrive on Mars aboard the SLS ? Which company will be able to bring for the first time a man on the surface of Mars ? Invited on an American TV channel, Boeing CEO Dennis Muilenburg said that the first man on the red planet will arrive in a Boeing rocket, the Space Launch System (SLS). Elon Musk has bet on Twitter that a SpaceX rocket will arrive first on Mars. Which company is best placed to meet its schedule ? Because on one side or the other, we are used to optimistic announcements and delays that get longer. Boeing and SpaceX will bring the most powerful rockets in a long time. But the question of who will come first is relevant to current and future developments. 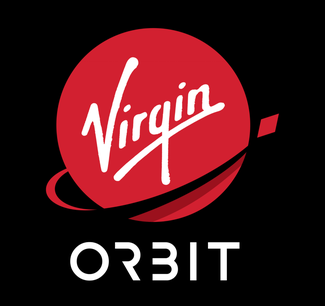 It is likely that it is indeed one of these two companies that will bring a man first to the surface of Mars, but which one ? Boeing’s plans are closely tied to those of NASA, which is the company’s customer for the development of the SLS. Boeing does not work alone on the development of the new heavy launcher of the US space agency. But the company takes the biggest part. For its part, SpaceX has two heavy launchers : the Falcon Heavy, which should come into service in a few weeks or months, and the BFR, which has at least 5 years of development. This is the BFR that Elon Musk’s company wants to use for its Martian adventure. It should be available after the competitor’s rocket, since the SLS is scheduled to enter service in 2019. But Boeing is working for NASA, and NASA wants to return to the moon before going to Mars. The most optimistic estimates therefore place a first martian attempt by NASA for the middle of the 2030s. For its part, SpaceX announced in september that it wanted to attempt a first inhabited mission to the red planet in 2024. But we know the low reliability of SpaceX calendars. It would not be surprising that SpaceX is 10 years behind schedule. 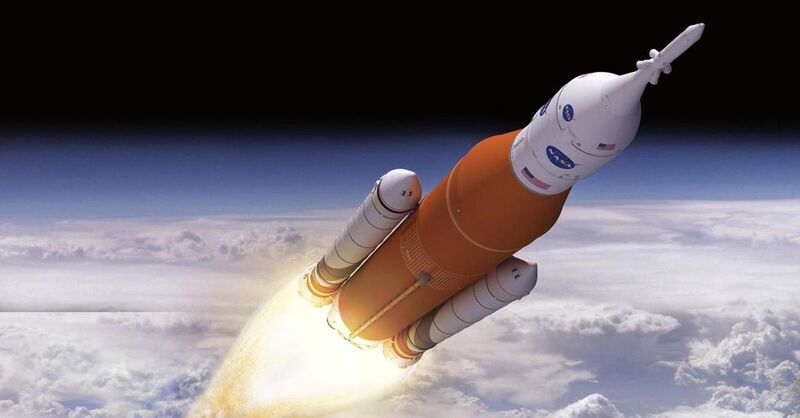 Boeing receives nearly $ 4 billion a year from NASA for the development of the SLS. The main purpose of Dennis Muilenburg’s statements is to justify this financial pitfall to US Congress and to US taxpayers. The development of the Space Launch System and its ancestor Ares 5 started more than 20 years ago when all the tests of the SpaceX Falcon 1 failed. So SpaceX would be able to put into service a BFR before the Block 2 version of the SLS, responsible for taking men to the planet Mars.